Arrival at Manali (6050 ft) registration, issue of equipment, introduction to Museum (F/N) - Lunch - Knot practice- visit Manali, Hidimba temple & back (A/N). Rock climbing, rappelling (F/N) - Lunch - Lecture on manners & customs of mountain (A/N). Visit to Manali town Adventure movie show. Trek to Solang (ht. 8134 ft.)-15 Km (A/N) via Old Manali, Goshal and Burua village - Lunch- Acclimatization trek to Shivling (4 Km) & back. Trek to Dhundi (ht. 9200 ft)- 8 Km(F/N) - Lunch - River crossing(A/N). Trek to Bakarthach (ht.10,800 ft.) - 4 Km (F/N), after lunch to Beas Kund - (ht.12500 ft.) - 4 Km & back to Bakarthatch - Night halt. Trek back to Solang Nalla -12 Km (A/N). Trek back to Manali -15 Km - deposit of equipment (A/N) - Luncha Closing ceremony (A/N) and departure in the evening. We offer 7 days Trekking Programme for individuals, families & groups from all walks of life during May-June & Sept- Oct in and around Manali i.e. 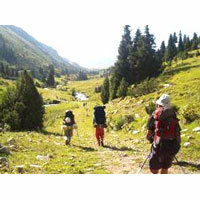 Beas Kund Valley under the guidance of highly professional Instructors/ Guides. The itinerary includes two days Rock climbing, Rappelling, River crossing & 5 days trek in the wilderness of Western Himalaya. 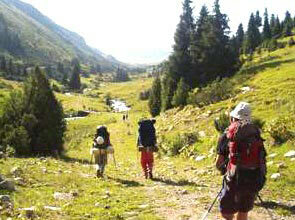 Rush & book the seats to join 7 days trekking adventure trip with us on the following dates. Track Suit/Jeans : -Two prs. Sports Shoes : -One prs. Socks Woolen : -Two prs. After joining the course, fees is not refunded. In the event of trekking programme being cancelled by this Directorate 100% of the fees will be refunded. And if it is being cancelled on the request of an individual 50% fee will be refunded. Loss/damage of equipment: Full cost will be recovered from the participants on account ofa loss/ damage of equipment. How to reach :-Manali is well connected by rail & road with Delhi, Ambala, Kalka, Pathankot, Shimla & Chandigarh. By Air from Delhi to Bhunter (Kullu) &50 Km by road to Manali. It is about 16 hours. Overnight journey from Delhi to Manali. Any disputes : Subject to District Kullu jurisdiction. NOTE : Programme is subject to weather conditions.